0 Comments Published by KL Ocs Kid on Saturday, November 3, 2007 at 12:32 PM. Liverpool midfielder Nabil El Zhar admits it was a 'dream' for him to score his first goal for the club at Anfield. El Zhar netted Liverpool's first in their 2-1 Carling Cup victory over Cardiff on Wednesday with a spectacular 25-yard effort. The 21-year-old Moroccan's strike also came at Anfield's famous Kop end, much to the delight of El Zhar who was making his first start for Liverpool since moving to Merseyside from St Etienne in October 2006. 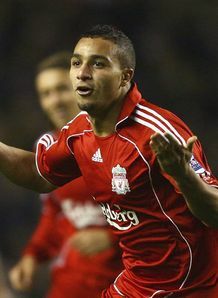 "It was a big dream to score in front of the Kop and now I am living that dream," said El Zhar. "I don't know if I have scored a better one than that and I hope it is the first of many in a Liverpool shirt. "I don't have the words to describe the feeling when I scored, it was simply amazing. It happened so quickly. "You have to forget about the big names you are playing with and try to show people what you can do. I hope I did that. "But I now have to try to keep at this level. I must get up in the morning, go to training and continue working hard. I scored but I have got more work to do to play in this team. "I have to keep my feet on the ground. All I've done is score - I haven't done anything in this team yet."